These delicious Easy Banana Pecan Sticky Buns with Cardamom can be made in just under an hour with an easy shortcut of using puff pastry for the dough! 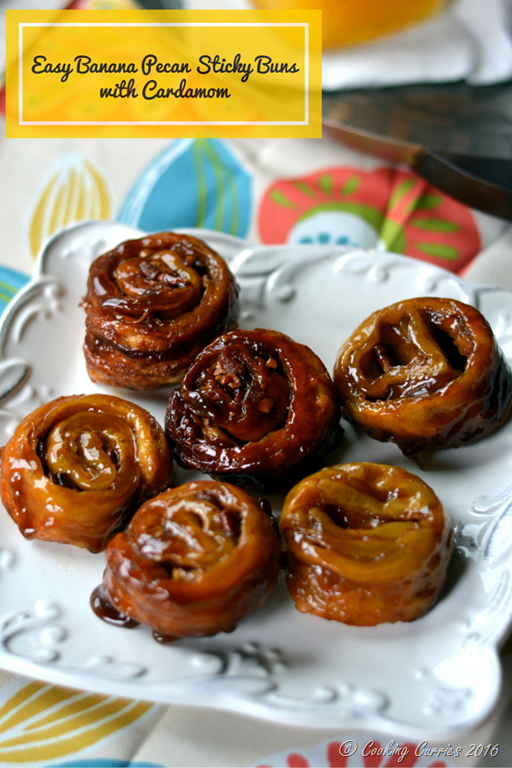 There is a story behing how I made these Easy Banana Pecan Sticky Buns. I mean, there is story behind most things I make. But this is really a story that led me to make this. Make this for someone I love, because he loves it! It was on Valentine’s day morning, that we suddenly decided to go out for brunch. I had plans to make brunch at home but I was sick for a couple of days leading into that Sunday with a pretty bad cold and cough, that we decided to just go out and eat. What with Valentine’s day and all, we were not too sure we will get a table, but were lucky enough to get one at Liam’s here at University Village. While we were deciding what to order from the menu, AJ spotted the sticky buns on their menu and suggested we get that. I thought he was only saying that because I always love to order something sweet on top of the eggs and other savories we order. But I was in the mood for the lemon waffles they had and I ordered that. I did not hear AJ ordering the sticky buns as well. It was the last one they had and thankfully we got it. We got to talking while eating that delicious sticky bun and that’s when this guy whom I had known for the last 17 years and been married to for the last 8 years, admits his love for sticky buns. Sticky buns! Yes! It never occurred to me that he might like this, as I always associated them with cinnamon buns and AJ hates the cloyingly sweet cinnamon buns. So, I was surprised. But when I thought about it, these are not that cinnamon-y. And they are actually pretty good and in fact, a little addictive too! Isnt it sweet that you still learn something new about the person you think you know everything about! I loved the new information I had and I wanted to make these sticky buns for him as soon as I could. After all, making food for the people I love and care about is a huge part of how I express my love for them. So, I was looking for recipes for sticky buns and they all required a yeast bun and took a lot of time to make. A confession here – I am a little petrified of working with yeast. The few times I have worked with it, I have managed to royally screw it up. So I was kinda sad that these buns needed me to work with yeast. That is when I came across an easy bun recipe that used puff pastry instead and I was so thrilled. I had some puff pastry and it was actually thawing in the refrigerator too, for something else that I had plans to make with it. Now that plan can wait. 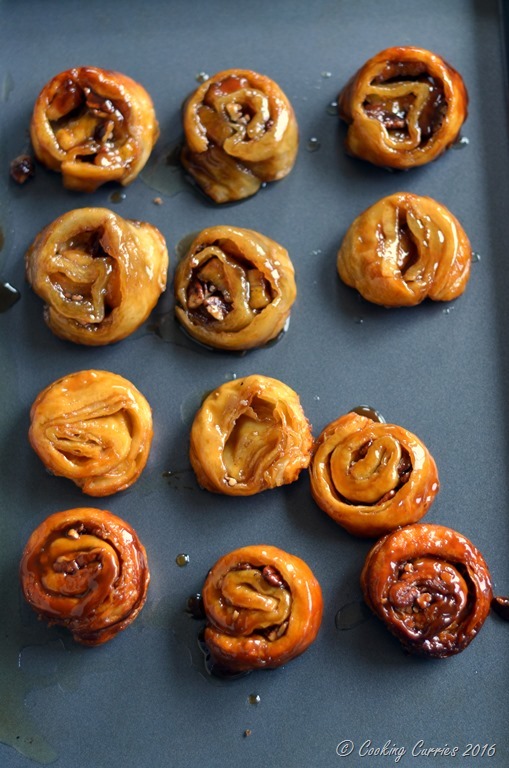 So, I pulled out the puff pastry sheets and made these super delicious, cannot stop at one kind of delicious, and very easy banana pecan sticky buns with cardamom. I love cardamom and wanted to add it to these buns. And I thought banana will be a wonderful addition with the cardamom and maybe make us feel a little less guilty about eating way too many of them, just maybe. I made a dozen of them for brunch and there wasn’t much left by the end of the day! Even V loved it! I mean, why will he not?! Right? Preheat the oven to 400 F. Line a sheet pan with parchment paper and place a muffin tin on top of it. Mix the 1 stick butter and 1/4 cup brown sugar in an electric mixer until combined. Divide this equally between the 12 muffin cups. Open the puff pastry sheet with the folds going left to right. Leaving an inch border on all sides, apply half of the 1 1/2 tbsp butter with a pastry brush. Sprinkle half of the 1/2 cup brown sugar, half of the 1/3 cup of pecans, half of the 1 1/2 tsp ground cinnamon and half of the 3 tsp ground cardamom on top of that. Layer the slices of one banana on top of it. Roll the puff pastry very tightly starting from the end nearest to you and finish with the seam side down. Cut off about 1/2 inch from either ends of the roll and discard. Now cut the roll into 6 equal pieces and place the spirals with the spiral side flat up into the muffin cups. Repeat with the other puff pasty sheet. 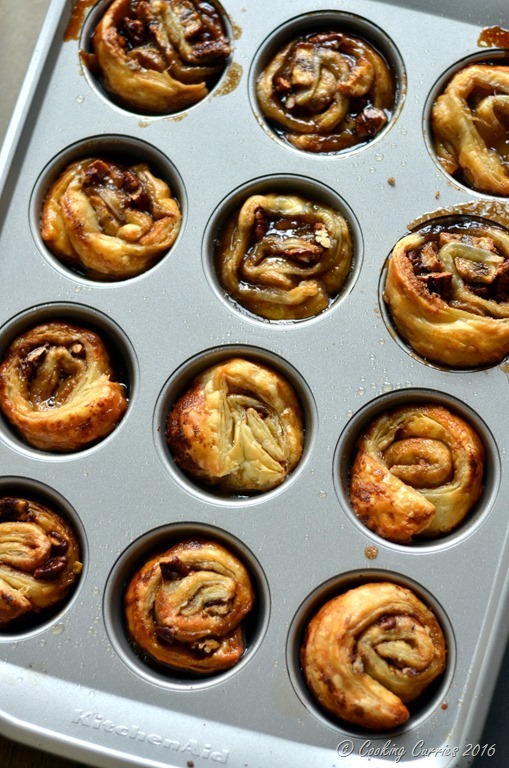 Bake for 30 mins, until the sticky buns are golden brown. Remove from the oven and after a couple of minutes, immediately, invert the buns onto a baking sheet and serve warm. Mmm my mouth is watering looking at your photos and combination of ingredients included in this recipe – all my favourites! Oh man these look too good to! I love your idea to use store bought puff up pastry – I’m all for making life easier when it can be done and this does the trick! Can’t wait to have all sticky fingers ?. Yummy recipe! Puff pastry is the best idea. I have a sheet in the freezer waiting to be used. 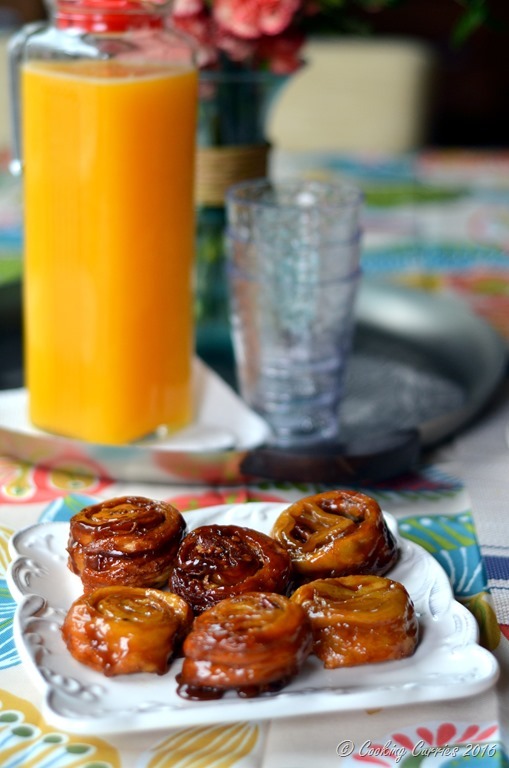 I love the idea of creating your own sticky buns that way they are as sweet as you want them. Love that they are easy banana. Who can say no to those. Yum! What a great short cut to use puff pastry. Love the flavor combination too. Holy mother of sticky buns. Pinning these for later- they look amazinggggg. I also write this while staring at a fresh quiche my mom and I just made for dinner and waiting to dig in- so I’m hungry. But they look SO good!